Available now in ebook and paper format. 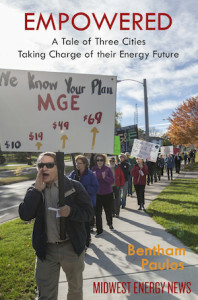 The book Empowered tells the stories of citizen movements in Boulder, Minneapolis, and Madison seeking greater control and progress toward a clean energy future. Click here for press coverage. The Showdown at the Electricity Meter, Governing.com, December 3, 2015. These Three Cities are Fighting for a Clean Energy Future, in Grist, Energy Collective and Renewable Energy World, November 2015. Germany Lays a New Foundation for Electricity Market, Power Magazine, November 12, 2015. Cheap Solar Comes to Wisconsin, Greentech Media, October 13, 2015. Wind Power Wins Big Under the Clean Power Plan, Greentech Media, August 25, 2015. Big Oil hates a California climate bill so much that they are telling outright lies about it, Grist, August 24, 2015. What is the Cheapest New Car to Drive? Hint: It’s an EV, Grist, May 11. Why the Koch Brothers War Against Clean Energy is Still Failing, Grist, May 8. Short- and Long-Term Economic Impact of the Clean Power Plan on Texas Debated, POWER Magazine, April 14. The bright side of California’s drought: More solar power, Grist, April 9. Minnesota’s Great Leap Into Solar Begins, Greentech Media, February 4. The Shape of Things to Come: Net Demand, Electricity Policy.com, February 4. A Philosophical Divide Emerges in States Considering the Future of Utilities, Greentech Media, January 23.